Well, that is we were very happy together. Then I went away to take a photography class and we – the rectangles and I – broke up. Things just weren’t working out between us, and it seemed like the right thing to do. We may get back together, sometime. But for now, we need some time apart. So, when you come back tomorrow, there’s a chance you may notice a slight variation on the sorts of images you may have come to expect to see here. Posted on July 13, 2016, in Photography and tagged 365 photo project, architecture, black and white photography, downtown, Leica, one day one image, photo a day, photography, postaday, san antonio, san antonio texas, texas. Bookmark the permalink. 10 Comments. The rectangles here are really working – looking forward to seeing the new images! I’ll be interested to see what you think…! 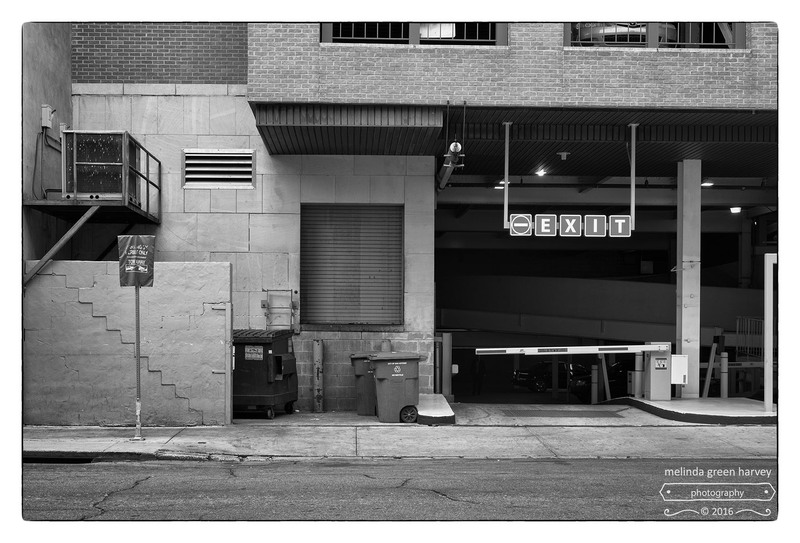 So a well-placed EXIT sign…. I was hoping we’d see (or hear) some manifestation of the class. And the thing is that I scheduled this image (and wrote the title) before I went to the class and before I knew how transformative it was going to be. That’s actually sort of creepy if I think about it…! Thanks, Laura. This photo is pretty full of them, isn’t it? I hope you’re still excited after you see the new stuff…!